The ultimate fast food! 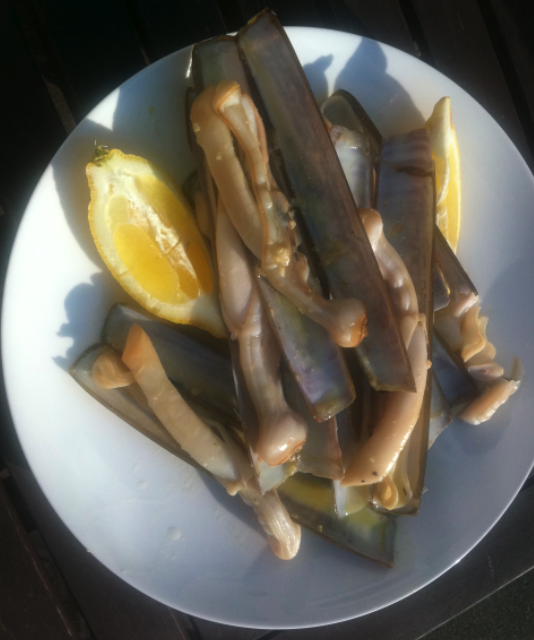 You can’t beat fresh razor clams on a sunny day with a good squeeze of lemon and nice chilled glass of dry white wine. Always best when there’s an ‘R’ in the month, and make sure that when you buy them from your fish monger that they shells are closed and the clams retract when you run your finger over the end of them. 1. Put a large frying pan on to the hob to warm up, then add the olive oil. 3. By now, the clams should have started to open. Give everything a good shake to ensure the clams are nicely coated in all of the oil, chilli and garlic. 5. Serve with all of the delicious juices poured over, and a good wedge of lemon to squeeze over. Some crusty bread to mop up the juice at the end of definitely advisable!